Am.Silver Grand Ch. & UKC Grand Ch. Pedigree available on request until I can get it loaded to site! Born: 3/29/06 Breeder/co-owner: Victoria "Moira" Simmonds" Armstrong, BC, Canada "Whitehawk Clumbers"
Tater is known by many nicknames ~ Tater, Taterman, Spud, Spudman, Taterlicious, Spudalicious, Hammy Yammy and George to name a few......... he is a wild n' crazy gremlin in a white suit that rules the house as the royalty he is! lol I am his mom and servant. He loves every person he meets and every dog. He has such an outgoing personality at shows that he has his own fan club of breeders/owners of many breeds. He truly was born to be IN THE RING. 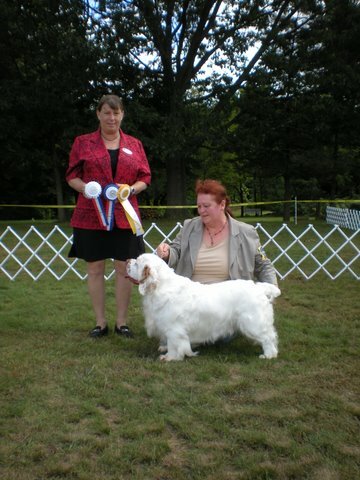 Shown above at his 2nd show Nov. 2006 @ 8 mo. of age, he won WD/BOW under breeder judge James Fankhauser for his first point, then earned 2 majors the same weekend ! He knew how to stamp his feet and "woo woo" at the judges demanding they take notice! Finished at 15 months with 3 majors, he continues to be Specialed mostly by myself in local shows only. We show for fun, until he decides he not longer wants to play anymore. At 2 years of age we started showing in UKC shows, where he earned his UKC Ch. earning numerous back-to-back Best in Show (5) wins as well as 6 Reserve BIS wins. Pearl was brought out and finished her UKC Ch., then Tater's daughter, Am.Ch. Millerwood's Courthill Delilah. With the 3 required UKC Champions needed for the Champion class, Pearl took Breed the first show, then Tater won 5 consectutive BOB's to earn his UKC Grand Ch. title. Confirmed by UKC, Tater became the very first Clumber in UKC HISTORY to ever earn the Grand Champion title!! In 2011, shortly after AKC started their Grand Champion competition, and showing only locally, Tater quickly finished his Am.Grand Ch. title making him the 8th Clumber in the country to earn the new title. I can confidently say that Tater is built like a proper clumber: short in leg, length of body, well-sprung ribs, powerful rear , fluid side movement and true to center of gravity coming and going.......and produces the same. He is at limited availability for stud. Many more photos will uploaded soon !